VietNamNet Bridge – The southernmost province of Ca Mau is expanding the farming area of acacia trees which offer high income for farmers. Harvesting acacia trees in Ca Mau Province. The province, which has about 8,5000ha of acacia forests, mostly in U Minh and Tran Van Thoi districts, harvests about 1,000-1,200ha of acacia per year, according to the province’s Department of Agriculture and Rural Development. Farmers can earn a profit of more than VND100 million (US$4,300) from harvesting one hectare of the wood, which is harvested after growing for four to five years. Tran Van Thuc, deputy director of the department, said the profit from acacia is twice higher than cajuput while the growing period is two years shorter. “Acacia has improved the lives of local residents living in forested areas,” he said. 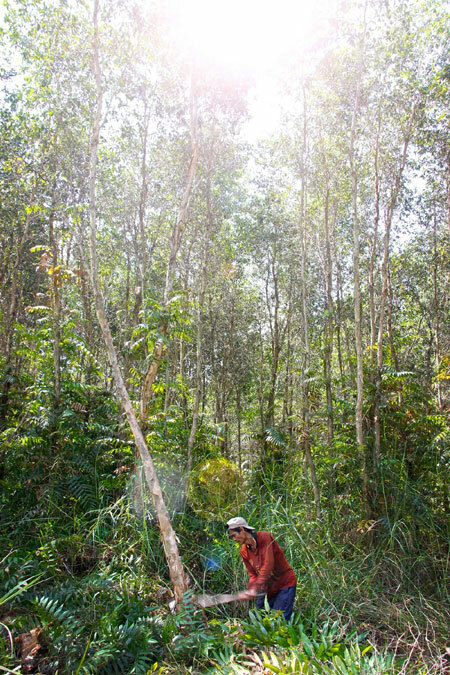 The province has 54,000ha of freshwater forestry, mostly cajuput and acacia trees. The soil in this area has high nutrients and is inundated in the rainy season, so most farmers who grow acacia trees create mounds to grow the trees on them. Acacia trees have been grown in the province since 2009. The province, which needs about 2 – 2.5 million acacia seedlings each year, can produce only a portion of the amount needed and has to buy the rest from other provinces. Last year the province’s Agriculture Seed Centre succeeded in producing acacia seedlings from tissue cultures. These seedlings grow quickly and have high yield, and are resistant to diseases and strong winds. The seedlings are disease-free, and have a straight trunk, only a few branches and strong roots. The U Minh Ha Forestry One Member Limited Company and the Thuy Son Investment Joint Stock Company have used the seedlings to grow acacia forests in the province. In other provinces, the survival rate of these seedlings is more than 90 per cent while the survival rate of acacia seedlings reproduced from the tree’s branch cuttings are about 70 per cent, according to the province’s Forest Protection Sub-department. When harvesting, the average yield of acacia trees grown form tissue cultures is 200-250cu.m per hectare, compared to 130 -150cu.m per hectare for seedlings from branch cuttings. The average income from planting acacia tissue culture seedlings is VND160 -200 million ($6,890 - 8,610) per hectare, up VND100 million ($4,300) compared to that of planting acacia reproduced from branch cuttings. Pham Van Mich, director of the province’s Agriculture Seed Centre, said the seedlings have adapted well to climate change and the local soil. “The seedlings also improve the quality of acacia wood and products, which enhances the brandnames in domestic and foreign markets,” he said. Nguyen Nhu Do, deputy head of the province’s Forest Protection Sub-department, said that farmers and companies should become more aware of the need to choose acacia seedlings from tissue cultures. Acacia wood can be used to produce paper pulp, construction wood, plywood, coal and fine art products. To expand acacia cultivation, the province’s agencies have transferred techniques to farmers to improve yield and shortened the growing period for acacia forests. The province’s agricultural seed centres and producers plan to produce more high quality acacia seedlings to supply to farmers and companies. Mịch said the centre would produce about 200,000 tissue culture seedlings next year and also reduce the price of tissue culture seedlings. Tran Van Hieu, deputy director of the U Minh Ha Forestry One Member Limited Company, said to improve the residents’ lives, the province should invest in infrastructure, especially roads to transport wood out of forests, as the cost of transport accounts for about 30 per cent of production costs. “The high transport cost reduces the profit of companies and farmers,” he said. Le Van Su, deputy chairman of the province’s People’s Committee, said favourable conditions would be created to encourage companies to rent forestry land to grow acacia under intensive farming model. The province will provide soft loans to local residents to grow acacia under intensive farming in the U Minh Ha area, he said. The province will also encourage wood processors and exporters to invest in wood processing plants and co-operate with growers to develop stable growing areas for their plants. The province will also hold more promotion activities to find markets for acacia wood. 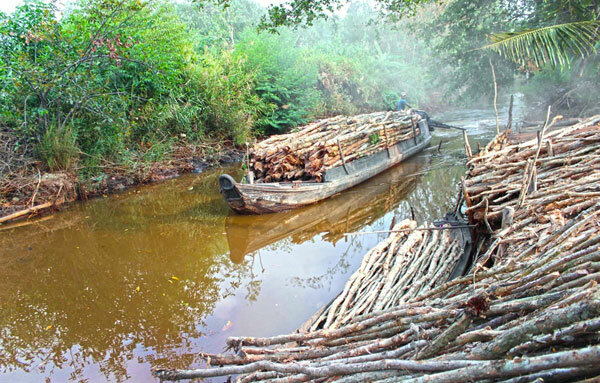 The wood is sold in Mekong Delta provinces and HCM City. Under the province’s agricultural restructuring plan, the province plans to have 18,000 - 20,000ha of intensively farmed forests by 2020. Of the figure, 12,000ha are acacia and the rest are cajuput. The province also targets increasing the value of its wood by 20 -30 per cent next year compared to now. Acacia is one of five products that the province has given priority to in its agricultural restructuring plan. The province has the largest forest area, mostly mangrove trees, in the Mekong Delta.